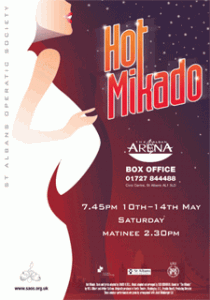 Much of the success of the current run of the Hot Mikado that finishes tomorrow in St Albans, will be put down, to singing, acting, dancing, direction, band and choreography. It is easy for people to forget we have had an awesome backstage crew, especially in the acquiring and making of props. One such person that really made a difference to the success of the show is Jen Clarke who was responsible for our great costumes. So Jen, how did you first get involved in costume making? I have been a massive film and theatre fanatic since I was little and always really loved the costumes in them. I remember watching the film of The King and I and being completely blown away by the costumes in that, particularly Deborah Kerr’s satin ballgown! I costumed my first production in upper sixth form, which was Jesus Christ Superstar, for which I made several “The Matrix”-style duster coats out of leatherette and PVC. I enjoyed doing it so much that I realised that this was what I wanted to do as a profession and went to university to train specifically for this type of work. I got a 2:1 degree in Costume for the Stage and Screen at the Arts Institute at Bournemouth where I specialised in Men’s tailoring. Since then I have done further courses in Womenswear Drapery at Central St.Martins and two courses in Eveningwear at the London College of Fashion, the latest of which I am currently studying. Amongst other projects I made costumes, and was the sole dresser, for an award-winning production of The Secret Garden at the Brighton Fringe last year, which was a site-specific, immersive theatrical production in an Edwardian townhouse basement. The Hot Mikado is my first major theatrical production and my first as Head of Wardrobe, the experience of which I am loving! I love the soldier outfits the dancers have, I understand some of their outfits were imported? Which costume in the show is your favourite? My favourite costume in the show has to be Kathy’s Strictly Come Dancing dress. It had originally arrived as a plain blue pleated dress, which I then customised with some trimming and over 700 diamantés! It took a lot of hard work and many, many hours to make but I love the way it sparkles in the stage lights. What do you enjoy doing when you are not involved in a show? When not doing Hot Mikado stuff I work as a seamstress at The Wedding Centre in Hemel Hempstead altering wedding dresses, bridemaids and prom dresses. I love going to the cinema, reading and generally doing craft things like intricate cross-stitches, drawing and making sock monkeys for my cousins. My greatest passion though would have to be going to watch my favourite rugby team, Saracens, play their matches. I’ve been going to see them play since I was 11 years old and have had a season ticket for several years. I pretty much go to every single home match and find it a great way to relax and enjoy myself…. it’s the only time I ever get really loud and usually end up screaming and shouting myself hoarse from cheering the guys on! 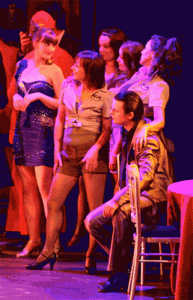 If you could make costumes for any musical, what would it be and why? I think the musical I would most have liked to costume would be the film of High Society starring Grace Kelly, Bing Crosby and Frank Sinatra. I watched a lot of musicals with my family as I was growing up and this was one of our family favourites because the story and the songs are so fantastic! The costumes designed by Helen Rose for this film are exquisite. I was lucky enough to see Grace Kelly’s dusky rose and blue chiffon embroidered dress that she wears when she dances the rumba with Frank Sinatra by the swimming pool at an exhibition at the V&A earlier this year – I got completely awestruck! I really love the style of the 1950s, so to make all of those dresses would be a dream come true and the men’s tailoring in that film is incredible too. There is nothing quite like a man wearing a really well tailored suit, and for an actor the transformation it allows them to undergo is magical!